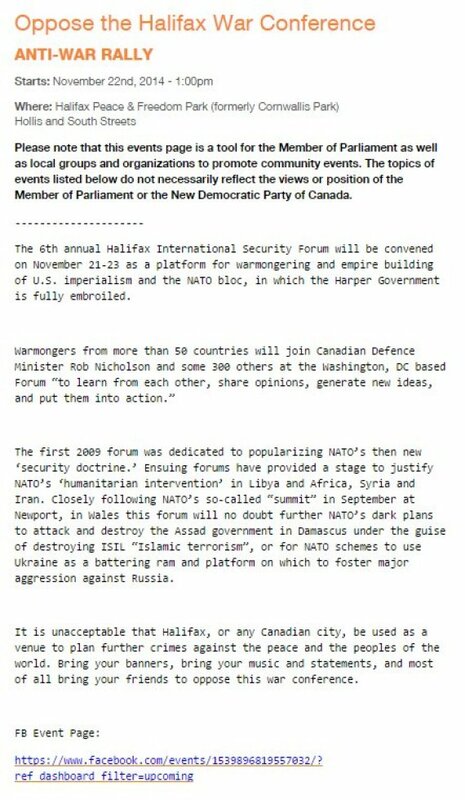 A Conservative MP says he is "disgusted" by an event listing on the website of the NDP's deputy leader, in which attendees at this weekend's Halifax International Security Forum are called "warmongers." NDP MP Megan Leslie allows hundreds of different community activities in Halifax to be promoted in the "events" section of her site, from holiday craft workshops to local basketball games. There's a disclaimer at the top of the page making clear "the topic of events listed do not necessarily reflect the views or position of the Member of Parliament or the New Democratic Party of Canada." However, Conservative MP James Bezan has taken issue with a listing on Leslie's site promoting a protest this Saturday against the backdrop of the forum, which brings together hundreds of politicians, military personnel and academics to discuss global security. The listing calls the forum, now in its sixth year, a "platform for warmongering and empire building of U.S. imperialism and the NATO bloc." It also states "warmongers" from 50 countries will come together to "further NATO's dark plans" to destroy the government of Bashar al-Assad in Syria and use Ukraine as a "battering ram and platform on which to foster major aggression against Russia." After being asked by a Tory backbencher Thursday to update the House on Canada's relationship with Ukraine, Bezan, the parliamentary secretary to the minister of national defence, zeroed in on Leslie. "The NDP member for Halifax is shamefully promoting on her website that NATO schemes to use Ukraine as a battering ram and platform on which to foster major aggression against Russia," he said. "That statement is despicable." Bezan neglected to make clear that the statement did not come directly from Leslie. Later Thursday, Bezan released a statement saying he was "disgusted" Leslie and the NDP are "promoting an event which denigrates NATO and calls our closest allies 'warmongers.'" "It is clear that the NDP are not a mature party and are not suited to leading of a G-7 country," the statement reads. "It is mind-boggling that the NDP would give voice to those who accused NATO of aggression against Russia after Putin annexed sovereign Ukrainian territory." Justice Minister Peter MacKay, who represents the Nova Scotia riding of Central Nova, also released a statement saying he was disappointed in Leslie. MacKay said that former NDP premier and current ambassador Gary Doer, former NDP leader Audrey McLaughlin, and current NDP foreign affairs critic Paul Dewar have all attended the forum in the past. "Does Ms. Leslie think it is appropriate that her website call these people warmongers?" MacKay asked in the statement. "Megan Leslie and the NDP must immediately apologize for publishing these disgraceful comments." On Friday morning, Tory backbencher Bernard Trottier also delivered a member's statement in the House questioning the maturity of the NDP in light of the listing. And Bezan, again, slammed Leslie during question period. NDP caucus press secretary Greta K. Levy told The Huffington Post Canada via email Friday that the events page is for community groups, not Leslie. "And it has a very clear disclaimer, including over the event itself," she wrote. But this is not the first time the NDP MP has faced criticism for these types of posts. Last March, Bezan accused Leslie of "championing" the conspiracy theory that 9/11 was an inside job after a listing for a talk hosted by the founder of "truther" group Architects & Engineers for 9/11 Truth was posted on her site.